Within a few weeks we can expect the fall-release of Microsoft Dynamics AX. However, this version will get the product name Microsoft Dynamics 365 for Operations. This version will include some localizations for countries which weren’t released within the latest version before. You can read about which countries/languages are supported on the Microsoft Dynamics 365 for Operations Roadmap page. The detailed countries are listed on the Globalization & Translation section. A few countries are still on the roadmap to be fully supported in Microsoft Dynamics 365 for Operations. Support for Russia and India are not included within the upcoming fall release. You have to depend on partners for Countries/languages which are not and will not be supported by Microsoft. In the past I have seen a lot of localizations developed by partners. To be honest, there are a lot of localizations which were not developed using standard AX patterns and didn’t follow best practices. Apart from questions if a localization was containing only local regulations or if it was a kind of market pack with nice to have reports, there were some basic deviations. In many cases an existing language was abused to get labels for a specific language. I can understand why partners did it, but it wasn’t the best solution. E.g. the languages ‘en-au’ (Australia) or ‘en-za’ (South Africa) were replaced with a local language. This is conflicting when multiple localizations used the same language. Also global organizations couldn’t use the localizations in a correct way when they also had offices in the countries where the language was abused. One of the reasons was that previous versions of AX had a licensing requirement for additional languages. A partner could add a new language, but only in the ISV layer with a specific license key. The license key had to be created with a specific ID where also not all languages known in Windows were supported. But also lack of technical knowledge could be a reason to bypass the correct way of adding languages. Like stated above, not all languages were supported to be included as language in Microsoft Dynamics AX 2012 and other predecessors. The user setup was controlled with the licensing model. Although the licensing model of Microsoft Dynamics AX 2012 is named user based and included all features, the check for languages was still available. Another separate story is the support of country/regions. To have features specific available within certain legal entities, a country/region property can be used on several objects like tables, fields, menu items to have features available only when the country/region of the legal entity matches one of the listed country/regions of the object. The country/region table in Microsoft Dynamics AX is provided by default with ISO standards. The country/region field in AX contains the ISO-3 character set, where the development property is using the ISO-2 coding system. As the country/region table also has the link with both the ISO-3 and ISO-2 coding system. In Microsoft Dynamics AX 2012 it is easy to create new countries and fill the two coding fields. However not all countries could be managed in the development environment. What caused this problem? A long answer to this question can be found in a thread (one of my favorite AX questions all-time) on the Microsoft Dynamics AX community: “CountryRegionCodes property: What are the valid entries“. A summary: There is a list maintained in the Microsoft Dynamics AX 2012 kernel which was not updated with new countries during several years. E.g. Curacao was not listed and thus not supported to be handled with country/region parameters on objects. A small side-note: This Caribbean Island became a country within the Kingdom of the Netherlands as of October 10, 2010. This was before Microsoft Dynamics AX 2012 was released, but as stated in the community thread the country list of ISO codes as of August 2007 was used. As I’m Dutch I would also like to tell you some interesting facts about The Netherlands. Many people also call it Holland. Well… to know the differences between Holland and The Netherlands you have to watch a video Holland vs The Netherlands. What’s new in Microsoft Dynamics AX/Microsoft Dynamics 365 for Operations? This paragraph will not tell all differences in the latest version; only those which are related to the topic of this blog post. Partners but also customers can still create new localizations. Localizations created in the ISV layer, can be included on the Dynamics Marketplace. One localization was regulated by Microsoft: Turkey. Kaya Consulting is the partner who was chosen by Microsoft to build this localization as you can read in another blog from my company. More interesting to know for you is if you can have a translation/localization for your country. Is this possible within the latest versions of Microsoft Dynamics? The answer is “Yes!”. The language list on the user options form is now built upon used languages within the Dynamics AX application. There are no license requirements anymore. Also there is no list of pre-defined country/language ID’s anymore. In fact, any language supported by the Windows operating system can be used. Note that about 40 languages are supported out of the box. Using the development environment it is possible to add new languages. How to extend this is technical and will be posted in a separate blog in the near future. The world is changing… The country/region codes property is still based on the ISO-2 coding system. The country/region list within your environment is used to determine which country is used for your legal entity. New countries can be added; also in the development environment. A developer can use new ISO-2 codes in future to add country specific features. Like the language support, this is also depending on development an explanation will be included in a separate blog post. 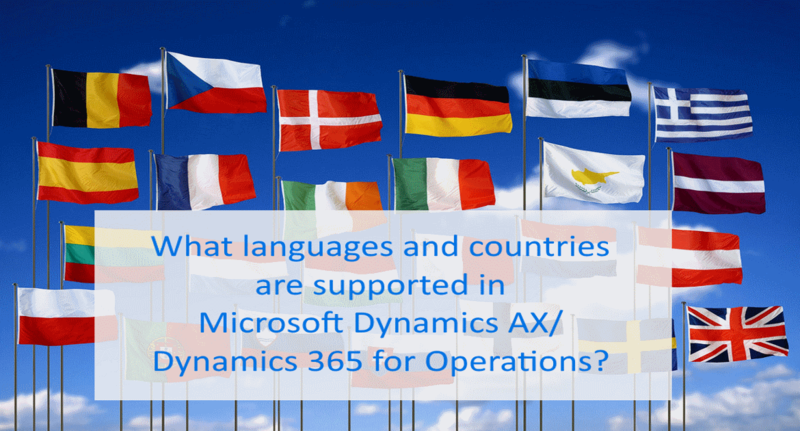 From my point of view, the topic of the different languages and countries which are supported in Microsoft Dynamics AX or 365 for Operations is quite useful.